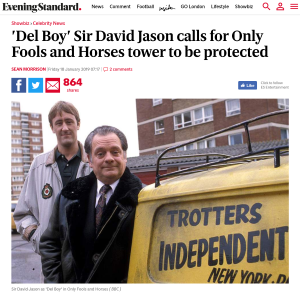 Sir David Jason has said it would be a ‘shame’ if the tower block featured in Only Fools And Horses is demolished and called for the building to be protected. Earlier this month it emerged plans are in place to demolish the tower as part of a £650 million regeneration of the area which will see more than 3,500 homes built. … Despite Harlech Tower being in Acton, Only Fools was set 13 miles away in Peckham, south-east London.